7 Signs You’re Eating Your Emotions - Baby Doodah! This post was sponsored by Alomune (http://Alomune.com), a daily pre-biotic supplement that helps you stay strong all year long. We all have bad days. Days where from the moment we get out of bed, everything goes wrong. When those days occur, many of us turn to food for comfort and support, and you may not even realize that you’re doing it. 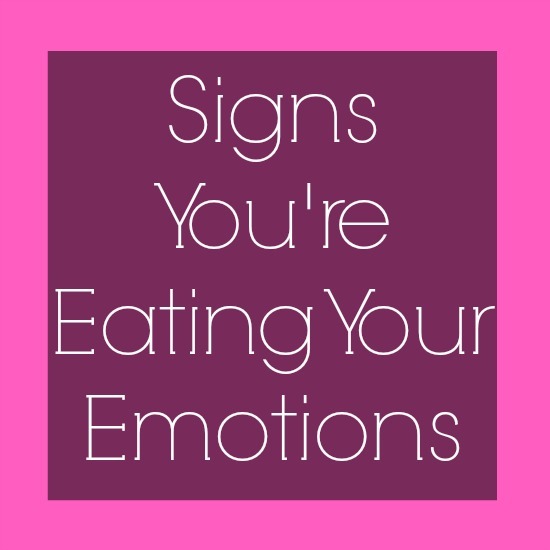 Here are 7 signs to look for that will tell you if you’re eating your emotions. Your need for food comes on suddenly. You’re sitting at your desk typing up a report and BAM, your computer blows up (not literally), and your report is gone. You immediately start to panic, because you had been working for hours on that report, then it hits you, that insatiable urge to eat. Remember, real hunger comes on gradually, not all of a sudden. You hide what you’re eating. If you ever run out and get that extra large value meal, and devour it in your car before you return to work, you are likely eating your emotions. You need to feel stuffed in order to feel satisfied. When you sit down to a meal, if you think that the only way you’re done is if your stomach is full to the brim, or your plate is clear, then you are likely an emotional eater. You crave one thing, and one thing only. If all you can think about is that giant candy bar in the vending machine then you are likely eating to hide your emotions. Instead, skip the candy bar, drink a glass of water and involve yourself in something you enjoy. Get your mind off of the food! You typically regret the food choices you made. Let’s face it, when you are feeling emotional and thinking about food, you’re not usually thinking of grabbing some carrot sticks, it’s usually that order of large fries, burger and large drink. After you’ve eaten it all you have a feeling of self-loathing mixed with guilt, and regret the entire meal. Your food cravings typically stem from the start of intense emotions. If you’re feeling bored, anxious, angry, etc., and the first thing you turn to is a bag of greasy potato chips, then you are eating your emotions. And finally, your comfort eating is mindless. When you are eating mindlessly you never think about the food that is going in to your mouth. You are simply sitting there, eating chip after chip, never registering the amount of food you just inhaled. If you found yourself saying that one or all of these sounds like something you deal with, then you are likely eating your emotions. There are better more effective way to handle those emotions, go to the gym and break a sweat, for instance. Keep your mind off of the bad for you foods that your mind is telling you that you need. Do you find yourself coping with emotional eating? If so, what is the best way that you’ve found to cope? I’d love to hear from you in the comments below. This post was sponsored by Alomune (http://Alomune.com), a daily pre-biotic supplement that helps you stay strong all year long. For more healthy living ideas & inspiration, please visit the Alomune Healthy Living blog (http://blog.alomune.com), their Facebook page (http://Facebook.com/alomune), Pinterest (http://pinterest.com/alomune) or join the conversation on Twitter (http://Twitter.com/alomune). What a great post! Thanks for linking it up with us for MMM link up party! I can relate and have done all of these. I had a lot of stress going on in my personal life that started right after Thanksgiving and just now has lessened up. During this time I ate my emotions and now I am paying for it. I cleaned up my eating and I am working on finding better ways to cope but its hard. Reading this has helped me get a better grip on the difference between being hungry and being stressed or bored. Hey Amber! Reading is a great coping mechanism, I just have a hard time finding time for that on top of my household chores, caring for my son and blogging. I just don’t know how some moms get everything done. It amazes me! Anyway, thanks so much for visiting! This inh’istgs just the way to kick life into this debate. Thank you for sharing this wonderful post on the CLIMB! Thanks Angie!! And thank you for hosting the climb.